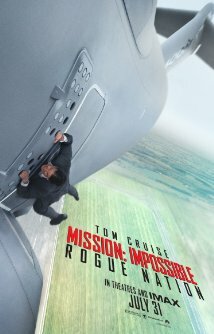 Mission: Impossible - Rogue Nation (2015), PG-13, 131 minutes - The Mission: Impossible franchise has proven to one of the strongest film franchises out there. It has survived nineteen years, five films, and even more impressively, the fall and subsequent rise of it's star in the collective public eye. One could even argue that through it all, the franchise is as strong as it has ever been. And after seeing Rogue Nation myself, I certainly wouldn't argue that point. This fifth installment continues the adventures of IMF agent Ethan Hunt (Tom Cruise), this time as he tries to track down and eliminate The Syndicate, an organization that, for all intents and purposes is the anti-IMF. Back on the home front, CIA Director Alan Hunley (Alec Baldwin) sits before the Senate oversight committee, requesting that the IMF be disbanded and absorbed into the CIA due to prior recklessness in the field and their lack of accountability for their actions. Hunley's request is successful, leaving Hunt with no IMF back up or resources to help in his mission to locate Solomon Lane (Sean Harris), the head of The Syndicate. Luckily for Hunt, he has a few extremely loyal ex-IMF team members that are more than willing to lend a helping hand: Benji Dunn (Simon Pegg), Luther Stickell (Ving Rhames), and William Brandt (Jeremy Renner), who ends up stuck between his loyalty to Hunt and his new employer Hunley. Ethan also encounters both help and resistance from MI6 agent Ilsa Faust (Rebecca Ferguson), whose motivations and loyalties are called into question on a number of occasions. Mission: Impossible - Rogue Nation provides everything we have come to expect from this franchise in heaping helpings: action, crazy chases and stunts, and all sorts of spyish goodness - some oh which are almost predictable at this point in the franchise, but who cares because they are just so damn cool. It is crazy that at the age of 53, Tom Cruise literally throws himself into his stunts. High speed chases, the beatings from fight sequences, hanging onto a plane for dear life as it takes off, the list goes on. That's right, the plane sequence that opens the film (and that is featured prominently in the trailer) was in fact Cruise, not a stunt double. The pace ramps up with that sequence and doesn't look back, causing the film to feel quicker than its just over two hour run time. Whether you are a fan of the franchise or not, Mission: Impossible - Rogue Nation is a very good spy thriller that is worthy of your time and well worth the price of admission in theaters.